New Comic-Con Clip & Trailer For Upcoming Throwback Slasher SUMMER OF '84 Is Within! 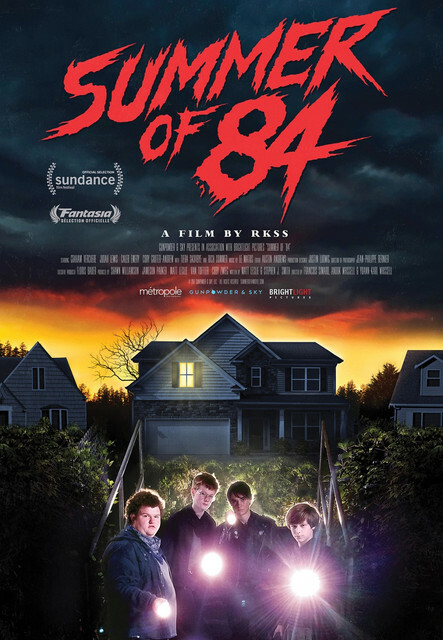 RKSS teams with Gunpowder & Sky on their upcoming release of the nostalgia era thriller, SUMMER OF 84. The film is directed by the Montreal filmmaking collective RKSS (Turbo Kid) which consists of François Simard and brother & sister Anouk Whissell and Yoann-Karl Whissell. You can view the Comic-Con clip and trailer below. SUMMER OF 84 stars Graham Verchere, Judah Lewis, Caleb Emery, Cory Grüter-Andrew, Tiera Skovbye, and Rich Sommer. SUMMER OF 84 will be released in theaters on August 10th, and available on VOD and Digital HD on August 24th.